Chemically mediated interactions are hypothesized to be essential for ecosystem functioning as co-occurring organisms can influence the performance of each other by metabolic means. A metabolomics approach can support a better understanding of such processes but many problems cannot be addressed due to a lack of appropriate co-culturing and sampling strategies. This is particularly true for planktonic organisms that live in complex but very dilute communities in the open water. Here we present a co-culturing device that allows culturing of microalgae and bacteria that are physically separated but can exchange dissolved or colloidal chemical signals. Identical growth conditions for both partners as well as high metabolite diffusion rates between the culturing chambers are ensured. This setup allowed us to perform a metabolomic survey of the effect of the bacterium Dinoroseobacter shibae on the diatom Thalassiosira pseudonana. 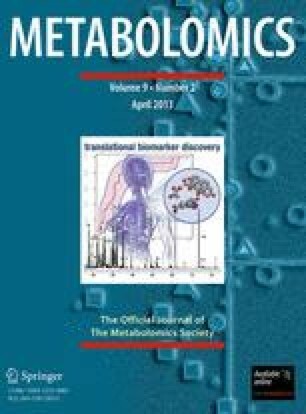 GC–MS measurements revealed a pronounced influence of the bacterium on the metabolic profile of T. pseudonana cells with especially intracellular amino acids being up-regulated in co-cultures. Despite the influence on diatom metabolism, the bacterium has little influence on the growth of the algae. This might indicate that the observed metabolic changes represent an adaptive response of the diatoms. Such interactions might be crucial for metabolic fluxes within plankton communities. The online version of this article (doi: 10.1007/s11306-012-0453-1) contains supplementary material, which is available to authorized users. We acknowledge the Jena School for Microbial Communication (JSMC) and the International Leibniz Research School for Microbial and Biomolecular Interactions for grants to CP and MAM. Further we acknowledge financial support within the framework of a Lichtenberg Professorship. The lab of US Schubert is acknowledged for access to the flow cytometry facilities.